With white bread, the difference is that the flour is more processed than that in whole wheat bread, and in this processing, the germ and bran of the wheat grain are removed, and only the white, starchy endosperm is left, which is the least nutritious. White bread also often contain added sugars, including high fructose corn syrup. Consuming an excessive amount of all this may lead to weight problems resulting in various degenerative diseases including diabetes and cardiovascular problems. Whole wheat flour has the germ and bran intact and therefore contains more nutrients. The brand in whole wheat flour bread provides fiber, protein, vitamin E and B, magnesium, manganese, iron, phosphorous, potassium and zinc. Whole wheat also contains a phytonutrient called plant lignans that have been found to have a protective effect against breast cancer and heart disease. How can I tell if the bread is really whole wheat? The color used to be a clue, but no more. Although white bread is white because it’s been bleached, some dark bread has just had caramel coloring added to it. Look for “whole grain” or “whole wheat” as the first ingredient on the label. If any other ingredient is first, put the loaf back and keep looking. If the label reads ‘enriched’, the flour is the same as that for white bread. The presence of caramel as an ingredient on the label often indicates bread coloring to darken white bread to brown. On the label, check for less than 401mg sodium, 1gm saturated fat and 4gm fiber per 2 slice serving. Are all whole wheat flour bread a vegan food? Not usually. Many of the loaves of bread sold in supermarkets contain non-vegan ingredients, including milk, eggs, honey, shortening or whey, —not to mention sodium stearyl lactylate, glycerides, emulsifiers, natural flavorings, artificial flavorings, and lactase, all of which may be derived from animals. Vegans often have better luck at bakeries but still need to ask if the bread pans are greased with animal fat. If you like to bake, you can make your own bread. Want to Bake brown bread at home? 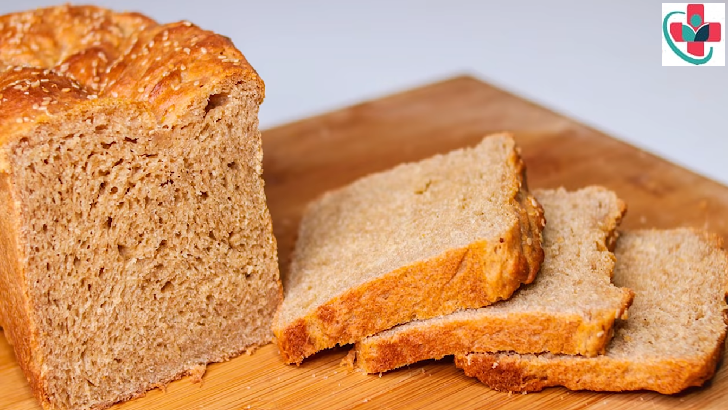 Here’s a Recipe for Homemade Whole Wheat Brown Bread.